Fall in the midwest is the most beautiful time of year. The leaves are all changing colors, and it is just chilly enough to start wearing chunky sweaters. I have a lot of collared tops, so a lot of times I will wear them underneath sweaters during the colder months. This is an easy technique to coordinate summer pieces into your fall wardrobe. This anchor blouse is from Ann Taylor. My grey sweater is from Target, and I absolutely love the grey cable knit texture on the front. 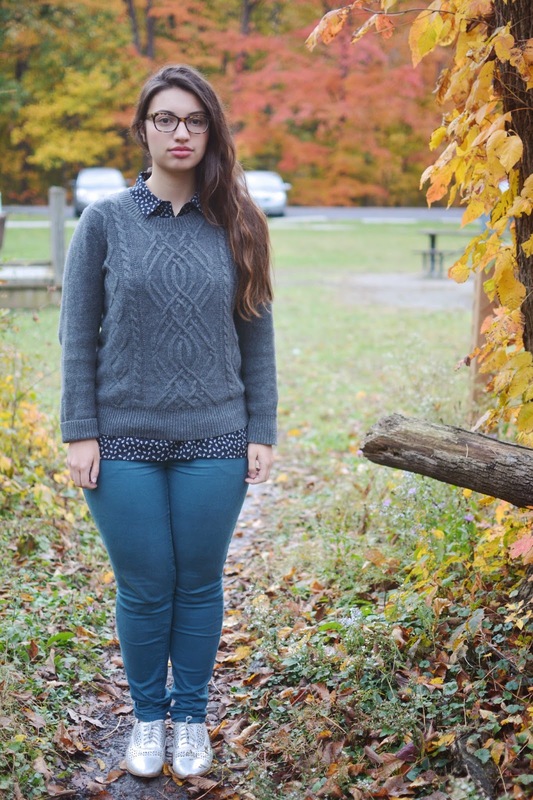 These silver oxfords are by Sam & Libby for Target, and my teal pants are from Forever 21. The good thing about the shoes is that mud and dirt wipe right off of them, so I am never too worried when wearing them out. My favorite new accessory are these glasses from Warby Parker. Warby Parker is a glasses company that allows you to order online and try on glasses in your home. At first I was skeptical, but the website is so easy to navigate and ordering is a quick and painless process. I got the finch frame in violet magnolia, which is a tortoise pattern with purple accents. I used to rarely wear glasses, but I am obsessed with these. You need to check out their website if you are looking for a new pair. I hope you have been having a great October and are getting excited for Halloween. I decided to be a sloth this year... We will see how convincing the costume is. A go-to look of mine is wearing a dress with an oversized jacket. It is a simple and casual way to dress up your every day look for going out with friends. I recently went to a friend's house warming party where I wore this chiffon aztec print dress by the brand Fire. I paired it with this oversized khaki jacket with red detailing by the brand Olive & Oak. My cross body black bag is from Forever 21, and I love using this purse for going out at night because it holds a lot and also allows you to be hands free. I paired the outfit with my suede black boots and tights. I am excited to be wearing more layers with dresses as we continue to head into fall. We have a three day weekend coming up to wrap up our school's midterms week, and I am excited to head home and do some much needed relaxing (and probably some shopping). 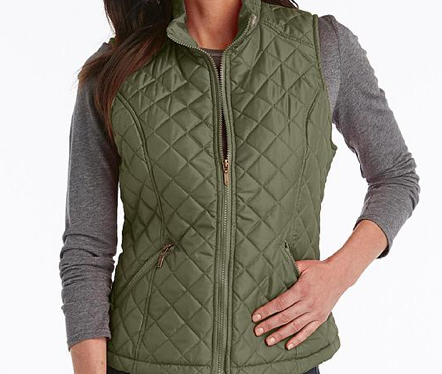 Puffer vests are extremely cute for fall to wear over a button down, long sleeve shirt, or a sweater. They are a great way to add layers to an outfit, and also help you stay warm during those crisp days. The factory website has a great variety of high quality vests which are half the price of J. Crew's. The website has 4 colors, as well as a navy plaid and camo print. The factory website often has sales and free shipping as well. This is a lower price, but still looks great. 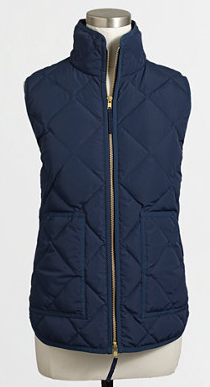 I actually own this in navy blue, but it is a bit thin so I wouldn't recommend it be used as an outerwear staple. This is more expensive, but the details make it stand out as a higher quality item. This only comes in navy blue with brown edges, and gold detailing. 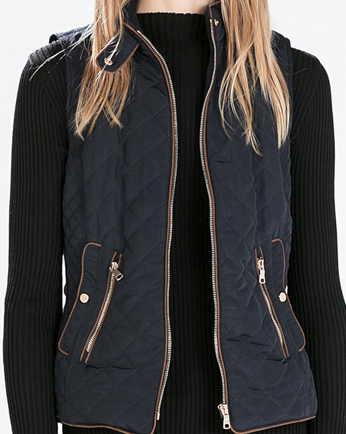 Banana Republic has a similar vest to Zara, but it comes in both black and navy. This is the most expensive of the options, but Banana Republic often has 40% off on full price items and if you sign up online you get 25% off your next purchase. 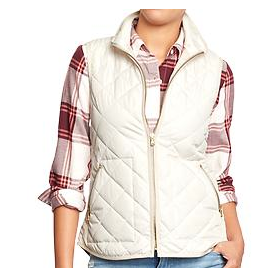 Sears isn't exactly where I go for clothes, but I saw this vest and was surprised by how good it looked. It isn't the highest quality, but for the price, it is worth it. Plus, it comes in multiple colors. Polka-dots are neutral right? 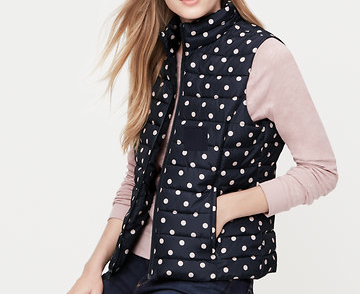 I couldn't help but add this adorable puffer vest to the list. It is a nice quality, and a bit more expensive, but Loft will often have sales throughout the season on their new fall items. 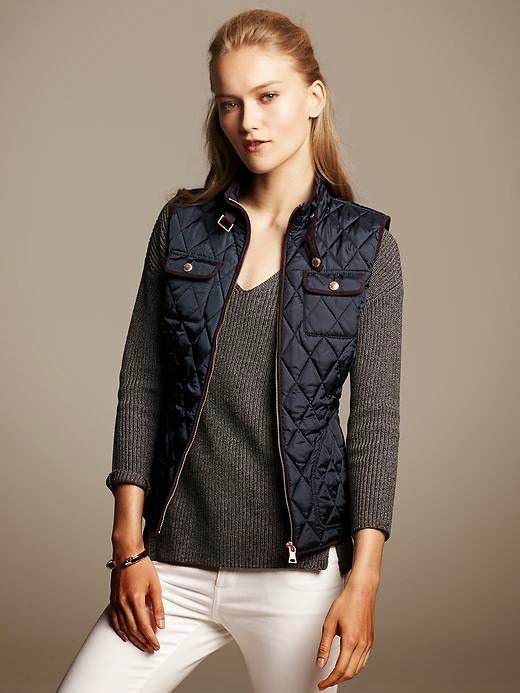 Vests are a great addition to any closet, and I know I want to get my hands on a red or a cream one. As it has been getting colder, I have been wearing a lot of cardigans over some of my favorite shirts. This kelly green one is from Joe Fresh. The hue is a great contrast with black and white, and adds a pop of color to the outfit. I love black and white stripes, so I couldn't pass up this peplum top from Banana Republic. This is a great piece in my wardrobe that can be dressed up or down. I decided to pair it with these jeans from Gap that I rolled up to keep the look more casual. Seriously, these shoes are so comfy. I find myself wearing them with almost anything. I have been doing my best to survive midterms week-- but it is finally over! 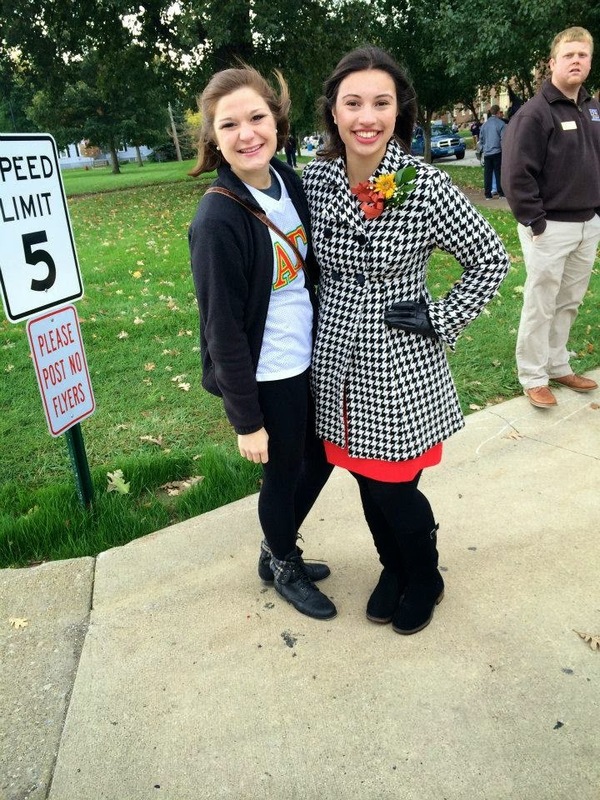 Last weekend, it was homecoming and I had a blast being a part of the Queen court and representing my sorority. Unfortunately, it was extremely cold out and raining during the parade and game so I have been struggling with a pretty bad cold this week. However, my family did come up to see me and it was a lot of fun spending time with them. I hope you are staying warm this October. I am taking a road trip to go to the Notre Dame game tomorrow afternoon, so I am going to be sure to pack a ton of layers! Where do I begin! I have been at school since the end of August, and it has been an extremely busy semester. To start it off, I cut my thumb on a mandolin the day before the first day of classes. If you ever watch the Food Network, you’ll know what a mandolin is. It has been healing nicely, but for the first few weeks of school I had my friends help bandage me, and it was difficult to do a bunch of silly tasks like put my hair up. Secondly, I was busy with formal sorority recruitment. I decided to be a recruitment guide this fall, so I helped take the women who were rushing to each chapter and served as an unbiased guide. 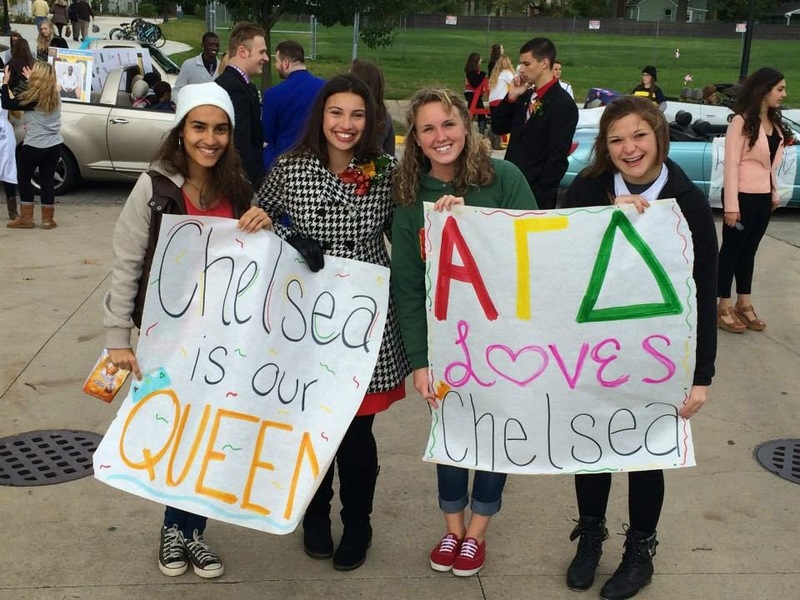 A part of the process for the recruitment guides is disaffiliating from your chapter until the end of recruitment. This meant nobody could know what sorority I was from or see pictures of me with other affiliated women on social media. With all this going on, I wanted to wait until after recruitment to start blogging again. At the end of summer, I was able to purchase some light cotton dresses from H&M. I love the skater style of the dress, and I knew that this was an item that I would be able to wear transitioning into the colder months. We have been lucky with some warmer, light jacket weather, and this dress is perfect for that. The dress is a tropical pattern in navy and white, so I layered it with my green surplus jacket from American Eagle to contrast against the design. I paired this outfit up with my staple summer shoes, my white Converse. Sometimes you have to wear white after labor day. I can’t believe how it is already October. Midterms are already next week and Homecoming for my school is this weekend. I am on the Homecoming court, so I am going to be extremely busy this weekend, but it will be a lot of fun to have my family come up and celebrate with me. I am trying to balance everything in order to survive the semester, because what I really love doing is blogging and sharing with you all. Now that some of the chaos is over, I am hoping to be able to blog more outfits and stay on top of things happening in fashion. I know I have talked a lot in this post, but I am excited to get back into the swing of writing again!